Back in 2011, I fell in love with something and crave it to this day. Beer and Cheese. I wrote it love letters. I made a beer and cheese mixtape. When I shower, I think of what beers will go with certain cheeses. It’s truly an obsession and I’m sure I was a drunken mouse in a previous life. The thing that sparked this tawdry relationship was a class I took with The Bruery’s cheesemonger at the time, Kendra Birdwell. In that class five years ago, one pairing struck a nerve so hard, I dubbed it an autumnal flavorgasm. Kendra paired Beemster’s X-O Gouda, which is brittle and crumbly like an old broken candle, yet is delightfully butterscotchy, nutty and pungent. You know those little crystalline clusters that mark a well-aged cheese? Beemster’s extra-old gouda is packed with them, which makes me giddy. 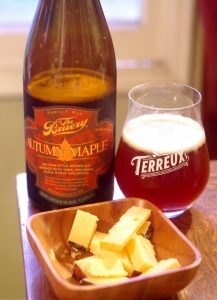 For the beer pairing, she went with The Bruery’s fall seasonal, Autumn Maple. The beer is Belgian at heart, with caramel, nutmeg, maple, molasses, and yams, yes…yams making up the big fall bouquet. The flavors come in waves; warm pumpkin pie, fruity Belgian yeast esters, and a kiss of booze reminding you it’s 10 percent alcohol by volume. For such a big beer, the palate is warming, with a soft effervescence. Together, aged gouda is like a key and Autumn Maple is like an ignition. Once the key is turned, big maple and earthy flavors zip around your palate like you’re driving a vintage Porsche on a Canadian mountain road lined with maple trees. Both are great on their own, but together, the beer makes the cheese flavors bloom, and the cheese makes the beer flavors explode like fireworks. It’s truly an autumnal flavorgasm. Got any favorite fall traditions while planning the Halloween decorations? Let us know in the comments. 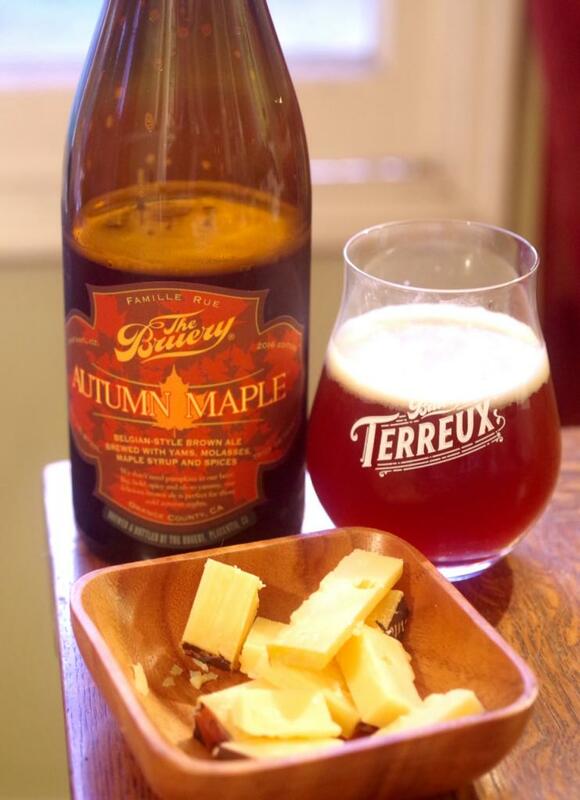 Autumn Maple is available throughout fall at The Bruery tasting room and most big-box beer stores. Whole Foods usually has both the beer and the cheese.